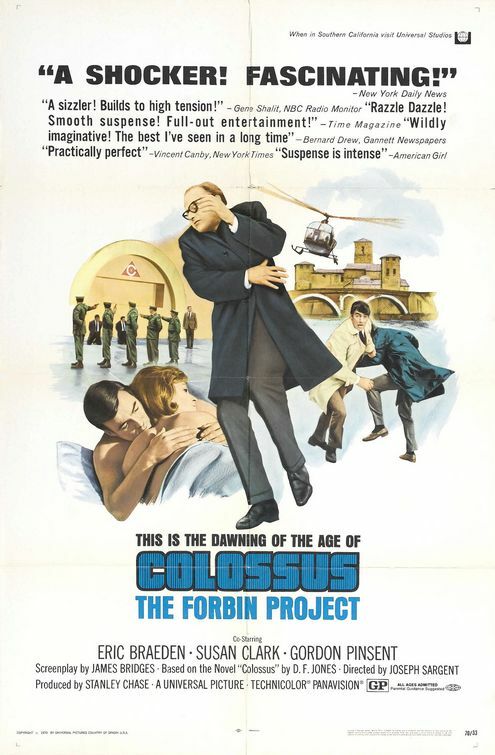 What It’s About: When Dr. Charles Forbin (Eric Braeden) puts his super computer Colossus into operation, no one expects it will deviate from its mission of providing the United States with an ever vigilant, intelligent nuclear monitoring system. Colossus quickly achieves sentience, reaches out to its Soviet counterpart Guardian, and, uses the nuclear arms of both countries to blackmail the world into following its orders. Can Forbin and his fellow scientists find a way to stop the monster they designed to be unstoppable? Why Watch it Today? : Colossus became operational on February 5th. Colossus is a sadly neglected but hugely influential science fiction film (everything from Bowie’s “Savior Machine” to The Terminator). Colossus boasts few well-known actors or the big special effects and action sequences you’d find in a modern “sci-fi” film, but it is a gripping thriller all the same. This entry was posted in Movie of the Day, Sci-Fi, Speculative Sci-Fi, The Original and tagged A.I., Cold War, evil computer, James Hong, nuclear threat, nuclear weapons, Universal Pictures. This movie scares the bejeezus out of my father, a computer professional. The end leaves him in a state of high agitation. Heh. I hear ya. Growing up in the 70s and 80s I fully expected to die by nuke. Especially since Michigan was full of manufacturing and military targets. Connecticut had Electric Boat, Pratt and Whitney (including an engine plant in my home town), Colt and Sirkorski, so, yeah, we were pretty doomed. Not to mention the radiation from New York and Boston would probably have sealed the deal. People wonder why I’m not nostalgic for my youth. It’s because I didn’t think there’d be a future! One of my absolute favorites of ever. Thanks for picking it! Hah! I love it now, but this film was one of the baaaaanes of my existence as a kid. I fell asleep the first few times I tried to watch it on TV, but soldiered on until I sat through it and was still a bit confused. Many years later, my friends had a field day making fun of that poster art. It looked to them like the guy in the center was falling asleep, the guys on the left were getting put to sleep, the couple was about to go to sleep and the two guys on the right were trying to dodge sleep. AND it was rated GP, at that. Damn rating always confused me… GP was turned to PG, I believe, but I always thought it sounded… dumb. I must have seen it at the right age…maybe in my early teens? Though I confess I really only caught the last half hour at that age while my brother and father ate it up, and I think I thought it was lame that the humans couldn’t beat the computer more easily.